Pre-moistened nail polish remover pads for quick and easy removal of nail polish. 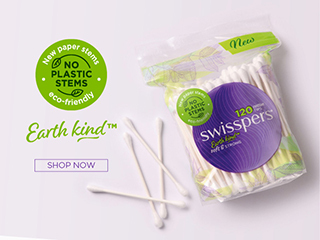 Swisspers Nail Polish Remover Pads are extra thick and pre-moistened cotton pads with a formula that easily removes nail polish while conditioning cuticles and promoting healthy nails. The formulation is acetone free and contains vitamin E to nourish. They are an ideal no mess and no fuss way to remove nail polish and can be used for travel as they are pre-moistened to avoid spills and meet the new international hand luggage requirements on flights. Propylene Carbonate, Alcohol Denat, Aqua, PEG-60 Hydrogenated Castor Oil, PPG-12-PEG-50 Lanolin, Tocopheryl Acetate (Vitamin E), Pyrus Malus (Apple) Fruit Extract, Parfum.